Women of the Wall staged a sit-in Sunday in protest of Minister Naftali Bennett's outline for a new prayer area in the Western Wall. After months of disagreements regarding Women of the Wall's right to pray in the Wall, Bennett announced Sunday a new prayer area for the Women of the Wall as part of an agreement between the group and the haredi community. The Ezrat Yisrael prayer area will be open to both men and women. Though perceived as compromise by some, the Women of the Wall see the offer as a violation of the Jerusalem District Court ruling, which ruled that women who prayed in the Kotel were not violating High Court ruling, and their arrests were not legal. The sit-in is scheduled to last until Monday, and members of the Women of the Wall group are urging those who sympathize with them to arrive at the Kotel, where they are sitting under Israeli flags. 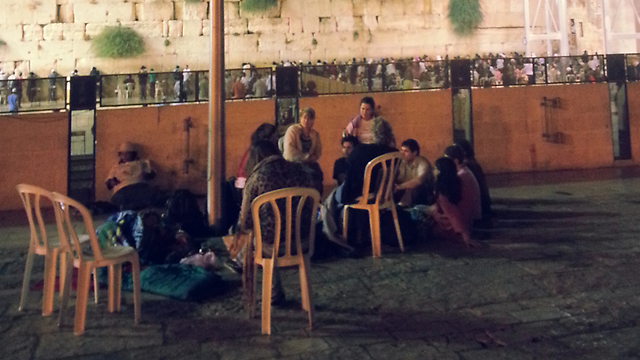 Anat Hoffman, leader of the Women of the Wall, said that she and the other members of the group rejected the outline and would continue to pray in the main plaza. Hoffman slammed Bennett's decision, saying he was supporting extremist positions of religious chief "at the expense of Israel's women. He does not promote unity, but rather a deep abyss between men and women and between Jewish men and Jewish women. According to Hoffman, the new are only observes the Wall from afar and does not allow for the most symbolic things – touching the Wall or placing a note. "After we were curse, spat on, and had eggs thrown at us, the haredi bullies are now rewarded by the Israeli government as the Women of the Wall are removed from the plaza," Hoffman note. "This offer is insulting, and does not meet the needs of our group," Hoffman told Ynet after Bennett's announcement. She added that the way it was done was faulty. "They should have held a discussion with is in trying to solve a 25-year long problem. At the moment, the current offer is no more than a sun porch." Dr. Ella Kaner, a member of the Women of the Wall, said: "I, like Naftali Bennett, am a member of the modern orthodoxy and religious Zionism. I resent the fact that they didn’t take into consideration the fact that our group consists of women of all movements, and I – as a representative of the Orthodox in the group – will not find my place in the new outline, which offers integrated prayer with no partition. "It's about time they give us a place where we can pray a true and honest prayer, without being constantly asked 'what's the motive.' The motive is the love of God." The prayer area will be for both men and women, and according to Bennett will open within the next few weeks. It is expected to accommodate 450 people, and will open 24 hours a day, seven days a week, with no entrance fees. Only prayer and bar mitzvah ceremonies could be held in the new area, and no weddings are allowed. Nor is, interestingly, panhandling. "I will not allow any disputed among Jewish people in this holy place ahead of Rosh Hashana," said Minister Bennett. "Our energies must be channeled to prayer, forgiveness and unity, alongside maintaining the status-quo in the Western Wall." Rabbi Uri Regev, with the Hiddush Association for Religious Freedom and Equality said that "It is sad to see that the even a government that is not dependent on haredim continues to discriminate against women and non-orthodox Jews in Israel." See all talkbacks "WOW oppose new prayer area at Kotel"